Here’s how YouTube can lead to the sale of your online course. Let’s use an example of a course called “Sleep Training for Toddlers”, or better yet, if you’re keeping up with my advice on choosing your online course topics and title: “How to Sleep Train you Toddler in less than 30 days”. I’ve put together a short checklist / summary as a reference for you. Get the Checklist here. There’s a few ways to do this.. the list below is one way I’ve found that works exceptionally well. As you’re telling them what they’ll learn, show a link to your site in the video (more on how to do this later) You can use YouTube’s Callouts for this with a link directly to your site. Something like ‘More info at sleeptrainingcourse.com” could appear on the video. No need to mention it in your script, just have it appear over top of the video. Get right into the lesson fast – save the sales pitch for the end of the video, they don’t know you yet and they’re not ready to buy. Offer REAL VALUE in the meat of the lesson – this should make up 90% of the video or more. 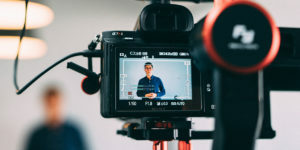 Depending on the size of your course you may have more or less material to give away, but I’ve found that the more value you give in the free videos the more it helps drive sales. Try to keep it between 3-7 minutes in length. Sleep training example – give them the essential items and items to remove from the room as you promised at the start of the video and in the video title. Ask for comments. During the meat of your video lesson, ask the viewers to leave comments below. Ideally give them specific things to leave comments on. It’s better to do this during your lesson than at the end. You can also ask for comments at the end of the lesson, just before your call to action – if you do this be quick about it as you don’t want them to leave before they hear the call to action. Close with a call to action. Now that they’ve gotten to know you and your teaching style, and they’ve seen that you add value to their life, now is the time to ask for them to take action. You do this by letting them know you have more great help/resources/lessons in your full online course on the subject. And let them know where to get it. Show a link to the site where your course lives. Again, similar to the beginning of the video but now you can be a bit more blatant and show the link for longer. Put it up and leave it up for a while. Remember, when a YouTube video ends, they suggest other videos for you to watch next. With short attention spans, web viewers often click on one and hop off to the next video. Avoid losing viewers by putting your link up and leaving it there for a while, 10-30 seconds. The video ends at 1 minute and 52 seconds, but continues for another 10 seconds showing videos to watch next on the same channel. It’s also part of a playlist which is another way to accomplish a similar result. Note that this has to be edited into the video before you upload it to YouTube and then you can add the calls to action over the embedded videos. That’s the overview of the structure of the video itself, we’ll get into more detail about how to set this all up later. Next up.. Part 3: learn the basic process of how you actually drive sales from YouTube. This information is easy to follow and right to the point. I will be successful working with the Thinkific team and looking forward to living my life’s passion. Regarding step 8 – Advanced Tip: Is there a way to have my own “Videos to watch next” come up without going back to re-edit and re-upload old videos? The easiest way to link to other videos from a video is to use annotations. You can have a text box or speech bubble pop up over the video with a link to the next video you’d like them to watch. To do this go to your Video Manager – find the video you want to link from and then select annotations. Also, if you want you can link directly from your YouTube video to your Thinkific courses – you’ll need to use the Google Site Verification tag – which you can find in the Advanced Settings section. I use that to drive students from YouTube to a sign up or purchase for my courses. Thanks, Greg. It took some time, because there are many videos, but it worked! Also, sorting the videos and putting them in playlists helped. Great, glad it worked! And yes, Playlists is another great way of doing this.